PE frozen mysis encourage exceptional appetite and growth - even in finicky aquarium fish! PE Mysis diluviana boast naturally higher fatty acid profiles and Omega-3's than enriched brine shrimp. PE Mysis are harvested live from pristine glacial lakes in Canada, flash frozen in premium condition with no binding agents or fillers. PE Mysis are an excellent food source for all freshwater and marine tropical fish that induces an energetic feeding response in aquarium fish. 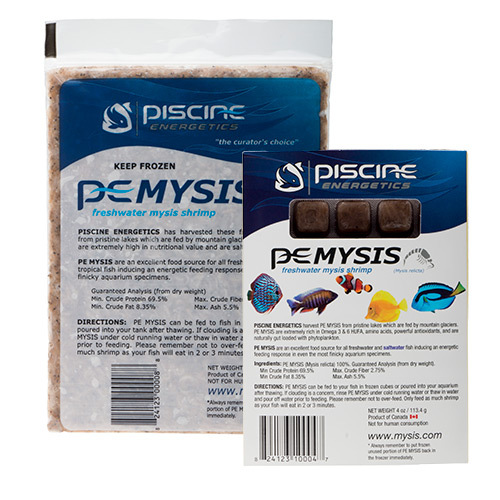 PE Mysis can be fed to fish in frozen cubes or poured into your aquarium after thawing. If clouding is a concern, rinse PE Mysis under cold running water or thaw in water and then pour off water prior to feeding. Please remember not to over feed. Only feed as much shrimp as your fish will eat in 2 or 3 minutes.